DIYEFI.org Forum - View topic - Proper code/class layout diagram before writing any code. Proper code/class layout diagram before writing any code. I would like to refine this diagram/note so that I can use it to create a new loader that utilizes a "comms suite". I used dia to create what I like to call a proposed class sheet. I don’t necessarily want to create all these classes at once, some have higher priorities than others. I also don’t want to work myself back into a corner making it too much work to add/change some of the underlying classes. I will use loading an s19 file from the GUI to the Device to iterate though the diagram. 1. the user loads the application creating within it an instance of the Communications/Operations class. 3. The user clicks connect and depending on their settings the Communications/Operations initializes within it self the a Data-I/0 class with the specified parameters. In this example Data-I/O will use the serial monitor over RS232. 4. The user clicks load and chooses an s19 file from the file menu. 5. The Communications/Operations class receives a file name parameter and a "load" command after which it reads out the file and gets/checks the payload data via the functions in this s19 lib. 6. CO class feeds data to the Data-I/O object who checks for proper acks etc depending on the transport protocol and set options. 7. After the operation has completed the user has the option to reset the device state and disconnect etc. I think what would be a big help is to define what each part should and should not do before writing any new code. I've had a bunch of graphviz tabs open in my browser for months, so I'm dumping them here for the time being. The balance were from the gallery page, trying to choose a style. Check out the other types of diagram that they offer. It USES graphviz, so it IS a front end to graphviz, just a text based one. Nice stuff. (*) --> "Looking for an EMS"
--> "Have money left over for..."
--> "Laugh at MS user"
--> "Still be very happy!" 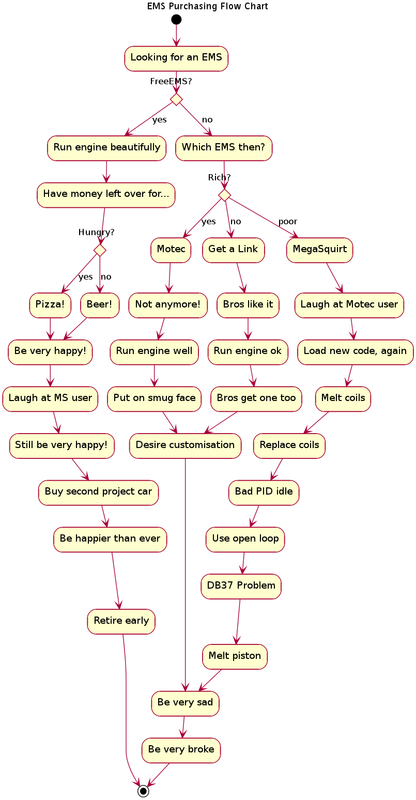 --> "Buy second project car"
--> "Be happier than ever"
--> "Put on smug face"
--> "Bros get one too"
--> "Laugh at Motec user"
--> "Load new code, again"
I hope you have a sense of humour! Sean and I were talking the other day and agreed that he should do a meta summary of the parts required to build an awesome loader. I didn't want to lose what we had discussed into the depths of time, so here it is! Selecting previously deselected package umlet.